When attempting to attain an objective or key result, people often refer to key performance, leading and lagging indicators. Unfortunately, a lot of people don't know the difference and how to use them to their benefit. This post should provide some clarity to the differences. 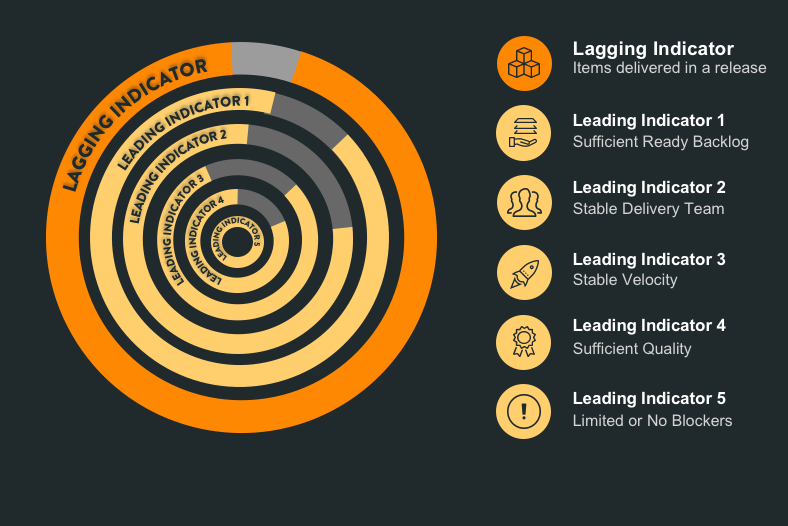 What is a "Lagging Indicator"
What is a "Leading Indicator"
These indicators are easier to influence but hard(er) to measure. I say harder because you have to put processes and tools in place in order to measure them. When you start building product, a lot of what you will understand and build will emerge over time. You don't know exactly what the level of effort is, until you finish. And if you are like me, given shifting priorities and dependencies, your lagging indicator is a moving target. If you use leading indicators, you can see if you're tracking in the right direction. You can use the leading indicators to make changes to your behavior or environment while there is still time. Diminishing ready backlog indicates we have less clarity on upcoming deliverables. An unstable delivery team indicates we don't have accountability to meet our commitment. Unstable velocity indicates we lack measurable progress that can forecast our completion by the release date. Now lets imagine you are managing the product development division of your company and your goal is to meet the release commitment you made to your customers. The outcome is easy to measure: You either finished the items you committed to or not. But how do you influence the outcome? What are the activities you must undertake to achieve the desired outcome? For example: Make sure there is enough ready backlog that the delivery team does not start working on "unready" work. Make sure your team members are available when needed and not being shared with other teams. Ensure the team is remediating bugs as they go and not waiting until the end of the release to fix them. Look out ahead of the delivery team and mitigate any business, organizational, or technical risks that may delay them. Now let's imagine your goal is to be compliant with SLA’s (service level agreements) you agreed to with your customers. For instance, the maximum allowed time to resolve critical priority incidents is 48 hours. The outcome (lagging indicator) is easy to measure: You either resolve your incidents in 48 hours or not. Again, ask yourself, how do you influence the outcome? What are the activities to achieve the desired outcome?